An arrogant and spiteful child, Terrance takes great pride in his intellect and scientific achievement, placing a higher value on the advancement of science than the safety of his fellow students and neighbors, whom he refers to often as "stupid" or as "plebeians". The son of famed geneticist Dr. Alphonse Mephesto, he was a high-achieving student in Herbert Garrison's third grade classroom at South Park Elementary, where he was often flocked by his close friends and henchmen, Bill Allen and Fosse McDonald during class events and at lunch. Terrance was the boys' chief rival at the South Park Elementary Science Fair in the third grade, working with Bill and Fosse to create a human clone, hoping to outdo rival Kyle Broflovski's purported pot-bellied elephants. With his father's help, they were able to spawn Evil Clone Stan. Freed arrogantly freed by Terrance, the clone escaped the ranch and wreaked havoc until it was tracked to the Marsh Residence and executed. Terrance lost the science fair subsequently, forced to present a five-assed monkey instead of his prized clone. Since his failed attempt against the boys, Terrance has receded from prominence. While some rumors suggest he may have, in fact, died not long after the science fair at the hands of Mecha-Streisand, he has remained present at South Park Elementary ever since, partaking in the occasional game of football and, more recently, Cowboys and Indians, using his own aerial contraption. Throughout his debut appearance, Terrance referred to those around him as "ignorant", "plebeians" and "stupid", seeing himself as far more superior and intelligent than they were. He valued intelligence, rationality and the pursuit of science over the safety of those round him, and this lead to his downfall as he released his clone of Stan prematurely, causing it to attack the town. He indeed exhibited a lack of concern for the townspeople due as they were all "stupid" anyway. Throughout his few appearances, Terrance exhibited some inventiveness, assisting in the creation of a human clone as well as crafting his unique aeriel bomber device for play with the other children. Terrance is an average-sized fourth grader with light skin, with a slight double chin and neck length dark brown hair in a widow's peak that appears to be slicked back, with a fringe parted from it. He wears a purple suit with yellow suspenders, with a white shirt and black tie underneath. He wears orange and teal pants. When playing with the other children, even prim and proper Terrance is willing to engage in a little cosplay. He uses a flying "chopper" to throw bombs when playing "Cowboys and Indians", and he constructed a costume for use in Zaron, but whether or not it was completed remains to be seen. Terrance's father is South Park's resident mad scientist, Dr. Mephesto, and Mephesto's adopted son Kevin was therefore Terrance's brother. Terrance looked up to his father fondly and believed him to be the best, although he whined when he was forced to kill Terrance's clone of Stan Marsh, appearing to lack his father's empathy, and as far as we know, attachment to asses. His mother has never been seen or mentioned to date. During his main appearance, Terrance was flocked by his two henchmen, Bill and Fosse, who helped him out with his science project and follow him around in general. The script refers to all three boys as 'nerdy'. In subsequent background appearances, Terrance is seen with other children. In "World Wide Recorder Concert", he spends much of the episode in close proximity to Red, suggesting they were friends or may have been dating, and they both sang together with Kevin Stoley in the film, suggesting a common friendship. Terrance was the boys' original rival, before Craig and Those Guys came to the forefront, and while we're not sure what he would think of them now, it probably wouldn't be too nice. Throughout all of his major appearances, Dr. Mephesto has always been seen at the South Park Genetic Engineering Ranch, alongside his assistant Kevin, and never has a separate residence has never been suggested or depicted, so it has been assumed that they live in an unseen residential section of the laboratory. Whether or not Terrance lives with them there, or possibly with his mother, is unknown, due to his lack of prominence, but he also appears in his father's laboratory in South Park: Phone Destroyer's menus. An icon for him (labeled Terrence) is included in the game's files, but he was cut from the final game. His possible role is unknown. During a tour of the main characters through the heavily revised South Park Genetic Engineering Ranch, the elder Dr. Mephesto displays on the third floor of his residence a variety of horrifying mutations of his "dead son" on display, using them to illustrate that his technology could someday help human beings as well. He remarks that "most people don't remember that [he] once had a young child named Terrance" and explains that Terrance was killed tragically by Mecha-Streisand when some children in town were playing with a relic that belonged to Barbra Streisand. It seems suggested his efforts to refurbish the lab are related to bringing him back, but Mephesto insists that he has no intentions of this, only to give his son additional asses so he could rest in peace. Terrance can be seen in his father's laboratory, as can his brother Kevin, during the Create-a-Kid process at the beginning of the game. He is also a playable character, where he uses a device with spinning blades and large engines to perform as "an aerial bomber who deals heavy damage". His card is 'neutral', not tied to any specific theme, and considered 'rare' though it can still be unlocked from relatively early in the game. Matt Stone recorded new dialogue for the character in this game, but his voice is pitched down, sounding similar to Bill Allen. While Terrance makes cameo appearances in the background of various scenes to this day, he has only ever spoken in "An Elephant Makes Love to a Pig". His biggest cameos were in "Raisins", where he filled in for Token Black in the kids' football game at the conclusion, and "Breast Cancer Show Ever", where he is one of the many kids cheering. Both Terrance Mephesto and Pip Pirrup are child characters from early seasons who were suggested to have been killed by Mecha-Streisand. In "Lice Capades", Terrance is seen waiting to be checked for lice in a line labeled '5th Grade', leading fans to speculate he was moved up a grade/grades. He is sometimes confused with Bill Allen due to their similar appearance. Terrance has been falsely reported as being on the school basketball team in "Elementary School Musical", for example, but that's Bill. 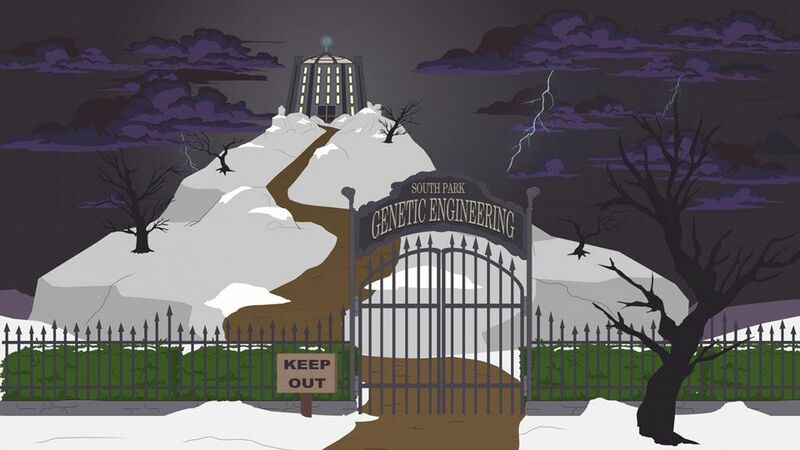 During the central storyline of "South Park: The Fractured But Whole", the player is tasked to visit the South Park Genetic Engineering Ranch to uncover the villains' efforts to genetically alter his cats and henchmen. The level "The Many Asses of Dr. Mephesto", styled on a classic dungeon crawl, portrays the location radically different from the series, featuring it as a sprawling science facility with a wide, bustling variety of scientists, employed by 'Mephesto's Tech', with the interior visually resembling the Visitor's Center from the 1993 film Jurassic Park, with Dr. Mephesto playing a role as a tour guide, while his assistant Kevin is absent and never mentioned, though he retains his penchant for multi-assed animals. During the tour, on the third floor of the facility, Mephesto displays "genetic mutations of [his] dead son" to display his hopes that his skills could one day help humans, lamenting that Terrance was "killed tragically when some children in town were playing with a relic belonging to Barbra Streisand", seeming to suggest the character died twenty years earlier during the events of "Mecha-Streisand", much to the boys' surprise. When Call Girl asks if the facility is his way of trying to bring back his dead son, Mephesto denies this and suggests Terrance needs "more asses" to rest in peace. Some of these mutations later appear in the background of the level while the player is tasked with turning off the power. The sequence conflicted with established canon in several ways, as Mephesto's ranch had previously appeared to be a relatively modest family operation without outside involvement, and was never portrayed as the sprawling facility seen in the game, with Kevin accompanying Mephesto in all of his major appearances, and in addition, Terrance has made background appearances throughout the series from his debut episode well into the twentieth season, during the game's production and well after the events of "Mecha-Streisand". These appearances continued even after the game's release, as he attends an assembly in "Sons a Witches", which aired in October 2017. Released one month later, the game "South Park: Phone Destroyer", also published by Ubisoft, features Mephesto in the more familiar version of his ranch seen in previous episodes, alongside both Kevin and Terrance during the character creation process, and Terrance also appears in gameplay as mentioned above, with new dialogue. The character's status is therefore considered 'alive' and this sequence in considered non-canon to the television series.